I officially announce October as the Lazer Sword month. In two weeks they will deliver serious damage to the club venue here in Poland and now they have finally released their first vinyl, a foretaste to the full length album dropping soon. 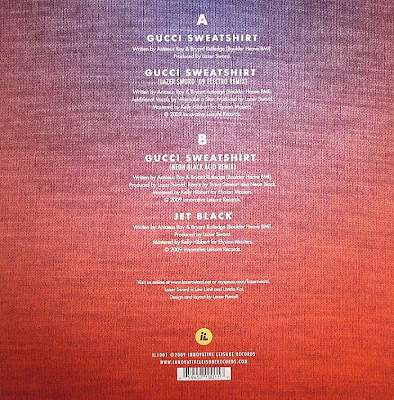 Gucci Sweatshirt 12" shows in a nutshell a broad spectrum of music inspirations and explorations of this talented duo of DJ's/Producers. From future hip hop and ghetto-tech through grime, acquacrunk and heavy bass to psychodelic electro. They are definitely on the fore-front of the boiling movement of West Coast and their live sets, meticulously prepared and performed, are legendary. They shared the stage with such names as Flying Lotus, The Glitch Mob, Kid 606, Bassnectar, Hudson Mohawke, Megasoid, Eliot Lipp, MSTRKRFT, Trackademics, Ghislain Poirier, Rustie, The Gaslamp Killer, Mochipet and tons of others. 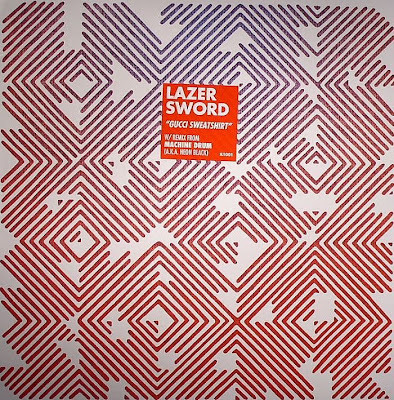 Lazer Sword also have a range of very good remixes in their portfolio: Robot Koch and Cerebral Vortex "Vortex Cookies", Hugg and Pepp's "Penguini", Larytta's - "You got nothing", Flying Lotus' - "Tea Leaf Dancer" to mention just a few. The original Gucci Sweatshirt, produced in 2007, was one of the first tracks I've heard by Lazer Sword, similarly as many other people attracted to the strange sound of this SF duo at that time. It has become a kind of underground anthem. It burns holes in the listener's skull slowly but thoroughly with distorted and mutated acapella, sick synths and bleeps and blaps spread in high density over the track. Then comes a real rocking bomb, the Lazer Sword '09 Electro Remix of the original track. It's f...g mental, I'm sure Lazer Sword will slay the crowds with this shizzle at the Halloween party in Białystok. The synths and beat are more crispy and uptempo, a typical Lazer Sword roller. B-side offers a fantastic Machine Drum (under a moniker of Neon Black) remix of Gucci Sweatshirt. Insane neon synths and infectious voice sample will definitely soak well in a dimly-lit clubs at 3 a.m. with the toughest dancers (your humble narrator definitely comes into this category). Jet Black is another ultra heavy joint with very very typical Lazer Sword synths and cut-up beats, forcing your head to nod like crazy. You definitely heard this one in some of their mixes. It grows and mutates and sick vocal makes it very unsettling. Which is exactly the way I like to digest music. Raw and straight-in-yer face. Overall, it's an essential purchase for anyone looking for future beats which can devastate dancefloors. I highly recommend this.